Antarctic researchers enter a state of 'psychological hibernation' to cope with the stresses of constant darkness, isolation and confinement, according to a new study. Spending long periods of time in isolation and confinement in any environment has been shown to cause negative psychological reactions and changes in health. Station personnel in Antarctica have reported a variety of issues, ranging from disrupted mood and anxiety to more severe psychiatric reactions. These changes are particularly pronounced during the midwinter period, and have come to reflect symptoms known as the 'winter-over syndrome'. With the support of the European Space Agency, researchers from The University of Manchester, University of Bergen in Norway and Tilburg University in The Netherlands examined the change in sleep quality, emotions and coping strategies during two winters in the harsh atmosphere of Concordia Station. The area has the driest desert climate on Earth, and a low air pressure and oxygen-poor atmosphere. It is completely cut off during winter, the mean temperature is -51°C, and the lowest recorded temperature is -85°C. Using psychometric questionnaires, the researchers asked personnel to report on their sleep, emotional states and coping strategies across the winter. They found a pattern of deteriorating sleep quality and declining positive emotions as the winter progressed, which then recovered as the sun returned. However, they also found that all of the coping strategies assessed declined during the winter period, and then returned after the dark winter phase had passed. This surprised the researchers, who had thought that active coping efforts – such as problem-solving and comforting self talk—would decrease, and more passive coping efforts—such as denial and depressive reactions—would increase in midwinter when personnel were truly cut off. 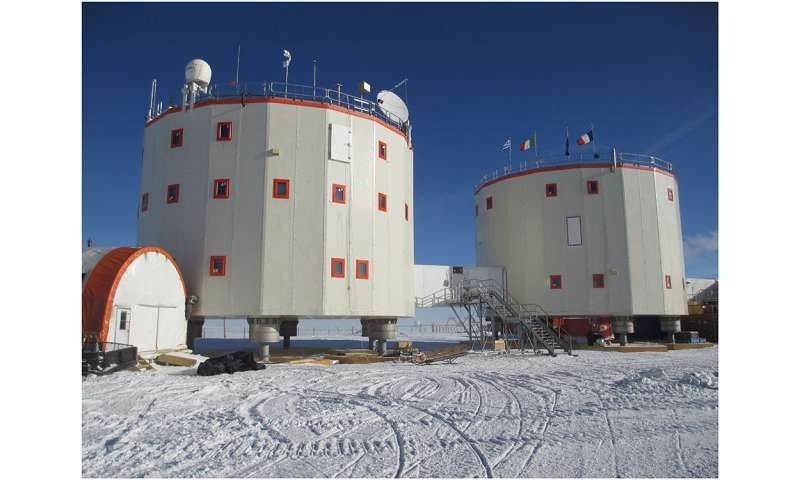 It is also important to note that Antarctic station infrastructure has developed, and personnel now live in relative comfort during their stay—this is very different to earlier studies, where the risk of exposure was higher and the resources available to mitigate stress were more limited. As a result, the mechanisms that individuals use to deal with stress during long duration confinement in these isolated but more comfortable habitats is likely to reflect the conditions people find themselves in. Overall, the research raises many questions as to how people maintain their health and cope with the environmental demands whilst living in these types of isolated and confined conditions. The findings have implications for people spending long amounts of time in isolated and confined conditions, particularly at higher latitudes. Antarctic studies have been viewed as comparable to spaceflight—so this research could also contribute to understanding how to keep astronauts well during long space missions. "Our findings could reflect a form of psychological hibernation. Previous research has suggested that this is a protective mechanism against chronic stress, which makes sense—if conditions are uncontrollable, but you know that at some point in the future things will get better, you may choose to reduce coping efforts in order to preserve energy." says Dr. Nathan Smith of the University of Manchester. "Historically, this will have been dangerous—while in this state you may be slow to react to changing conditions, which in extreme cold weather environments could result in serious injury or death. However, Antarctic stations are much more habitable nowadays, and provide high levels of protection against the elements—so detaching from chronic stress as a coping mechanism could be effective."